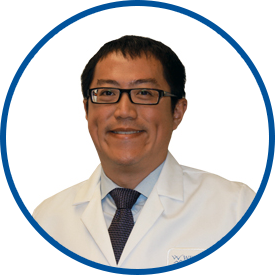 Dr. James Jen is a vascular surgeon who cares for patients with circulatory disorders of the arteries and veins. He is board certified in vascular surgery as well as general surgery. He has expertise in caring for the full spectrum of vascular disease including diagnosis, medical management and surgical and endovascular therapies. He specializes in advanced endovascular treatment for aortic aneurysms, peripheral arterial disease, carotid occlusive disease, dialysis access and diseases of the veins. Dr. Jen received his undergraduate degree from Princeton University. He received his medical degree from the Stony Brook University School of Medicine and went on to complete his internship and residency at Stony Brook University Medical Center. He completed a fellowship in vascular surgery at Mount Sinai Hospital. Prior to joining Westmed, he was a vascular surgeon at Abington Hospital, Jefferson Health in Pennsylvania. Dr. Jen is affiliated with Saint Joseph’s Medical Center, where he serves as the chief of Vascular Surgery, co-medical director of the Center for Advanced Wound Care and Hyperbaric Medicine, and a member of the Quality Assessment and Performance Improvement Committee and Medical Board. He is also affiliated with White Plains Hospital, New York-Presbyterian/Lawrence Hospital, Greenwich Hospital and Saint John’s Riverside Hospital. He is a Fellow of the American College of Surgeons and a member of the Society for Vascular Surgery, American Venous Forum and New York Society for Vascular Surgery. Dr. Jen also serves on national leadership committees for the Society for Vascular Surgery and the American Venous Forum.